Deputy Prime Minister Vuong Dinh Hue has asked ministries and sectors to promptly issue documents guiding the implementation of the “One Commune, One Product” (OCOP) programme, while calling for financial and credit organisations to support it. Addressing a conference in the northern province of Bac Giang on July 14 to launch the programme for the 2018-2020 period, the Deputy PM said that OCOP is an important solution to restructuring agriculture and building rural areas, promoting the country’s sustainable growth. He expressed his belief that the programme will help improve trademark and quality of Vietnamese agricultural products and services. OCOP aims to enhance value of local products to the national and global level, he said while highlighting the major role of farmer households, co-operatives and small- and medium-sized enterprises with policy support from the State, he said. “OCOP is a process having its start but no ending,” the Deputy PM stressed, adding that after 2020, the Government will review the programme before launching it for a long term. He also asked media agencies to focus on popularising the programme. The Ministry of Agriculture and Rural Development (MARD) was assigned to guide localities in implementing, evaluating and rating OCOP products. MARD Minister Nguyen Xuan Cuong said that the OCOP programme is considered a specific and effective measure to promote products at commune and district levels. It objectives in the 2018-2020 period include developing strong agricultural, non-agricultural products and services in each localities towards the value chain with the involvement of private and collective economic sectors. It is expected to contributing to the restructuring of the rural economy, reducing the migration of rural labourers to cities, and protecting the environment and maintaining social stability in rural area, while effectively implementing a criteria in production in the new-style rural area building programme. Cuong added that developing agricultural tourism is one of the important measures to promote OCOP. So far, 60 out of total 63 localities nationwide have started building plans for OCOP Programme, of which 30 localities have finished the work and six have approved and implemented the plans. Particularly, Quang Ninh has entered the second phase. Dang Huy Hau, Vice Chairman of the People’s Committee of Quang Ninh, said that the province has developed 294 products with the engagement of 180 production facilities, including seven five-star products. 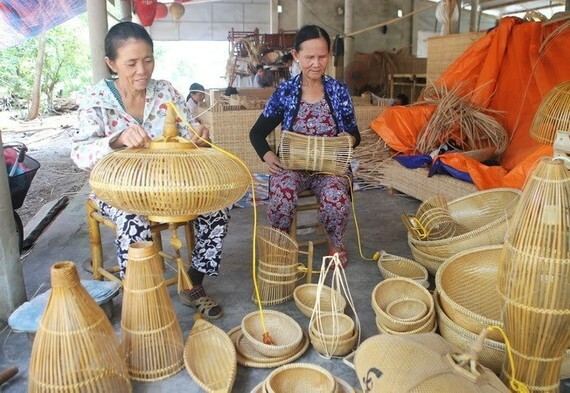 Meanwhile, Bac Giang province aims to standardise at least 50 percent of its current products with six five-star products. In 2030, the province hopes to have 170 OCOP products. According to Minister Cuong, Vietnam currently has 6,010 registered agricultural enterprises, co-operatives and production households, with 4,823 strong products. He highlighted the need to grasp opportunities of the fourth industrial revolution to produce OCOP products with the model of Agriculture 4.0, of which three key pillars are smart farms, smart farmers, and smart officers.